Anthony Lemont Peters (born April 28, 1953) is a former professional American football safety for ten seasons in the National Football League (NFL) for the Cleveland Browns and Washington Redskins. He played college football at the University of Oklahoma. 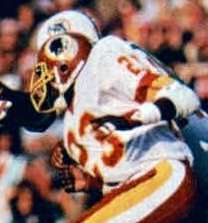 He helped the Redskins win Super Bowl XVII, the 1982 and 1983 NFC Titles, and the 1982, 1983, and 1984 NFC East Division Titles.